Now that Amazon has confirmed that the studios’ new “Lord of the Rings” series will be taking place during the Second Age, you might want to jump into the earlier books and learn about the stories. Several books cover the Second Age, and they all feature fantastic characters and important events from the time-period. First of all, I want to strongly recommend the Audible adaptations that Recorded Books created for “The Hobbit” and the “Lord of the Rings” series. The company also created audio adaptations for a few of the earlier works that we will go over. I listen to the franchise, from “The Silmarillion” to “The Return of the King” one or twice a year, and these audiobooks feature beautiful narrations. They are perfect just before bed, commuting, or while traveling. The Audible versions have the correct pronunciation for the Sindarin or Elvish languages, including the locations and family names, and they even feature a few songs. The songs take some getting used to, but they end up becoming quite enjoyable. I’ll leave a link to the audible versions that I’ve enjoyed the most, along with the best maps and family trees that I’ve found scattered across the internet. The lands of Middle Earth and the entire world change shape throughout the story, so having a map handy gives you some perspective on the journeys and realms that are mentioned throughout the books. The maps are a terrific companion to the audiobooks since you can look at the maps and family trees while listening to the story. If you’ve never read any of “The Lord of the Rings” books, you should read “The Hobbit” and “The Lord of the Rings” series before diving into the earlier works. If you’ve only seen the movies, you will be missing some information, but you’ll know enough to jump into the earlier stories. Even the earlier books allude to events that take place in “The Lord of the Rings,” and assumes that you’ve read those books. I should mention the LOTR Project, which I’ve linked to several times below. It’s a fantastic resource for “The Hobbit” and “The Lord of the Rings” series. You can easily trace the routes of the main characters in each of these stories, and the maps are highly detailed and simply wonderful. This website is a must-have when reading “The Hobbit” and “The Lord of the Rings,” and there is some information about “The Silmarillion” that can help you understand the layout and the characters. 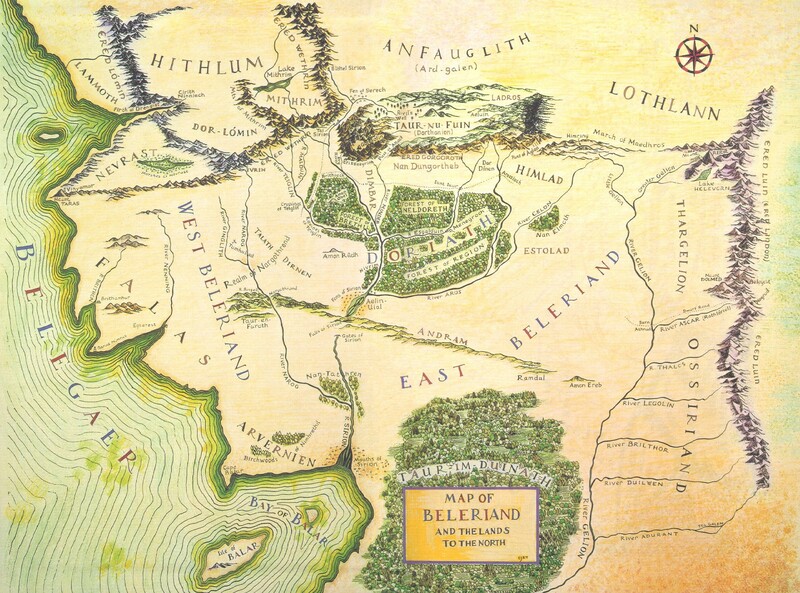 The maps can be a big help in later books like “The Children of Hurin” and “The Fall of Gondolin” if you switch from Middle-Earth to Beleriand. There is a great family tree of the Elves on this site, but the layout isn’t great for phones. I found a fun, illustrated family tree that I’ve linked below that works a little better on smartphones screens, so you can quickly pull it up whenever you need it during the story. The LOTR Project family tree is more detailed, so I wanted you to know about both options. No better place to start than at the beginning, and “The Silmarillion” starts at the creation of the world. This gigantic collection of writings reads like a cross between the Christian Bible and a history book but is essential for understanding the First and Second Ages. The collection explains the creation of the world, the god that created it, the lesser-gods that made the world their home and introduces the main antagonists Morgoth and Sauron. The book also explains how Elves, Men, and Dwarves came to live in Middle Earth. The book gets its name from the Silmarils, three jewels created by an Elf named Fëanor which become the driving force behind most of the acts in the Second Age. While the events of “The Children of Hurin” are covered in “The Silmarillion,” this edition gives you a better understanding of the story. Modeled after a traditional Greek tragedy, “The Children of Hurin” is much more like a traditional novel than “The Silmarillion,” and this version is narrated by Christopher Lee, who played Saruman in “The Lord of the Rings” movie adaptations. You will hear about Beren and Lúthien in “The Silmarillion,” and it’s one of the best love stories in all of Middle Earth’s tales. Beren was a mortal man and Lúthien was an immortal elf. Descendants of the two are still part of the story right up to “Lord of the Rings: The Return of the King” and the book has become a fan favorite over the years. While I love this story, I haven’t found an audible version that I enjoy, so I’ve linked the novel version. Again, this story is part of “The Silmarillion,” but this version is put together to read like a novel. Unfortunately, I have not found a terrific audiobook adaptation of this novel. I’ve linked the best version of the story I’ve found. When reading “The Hobbit” and “The Lord of the Rings” series, the lotrproject offers the best maps and information. If you are skipping the books and just going for the movies, “The Hobbit” was adapted into three movies. You have “The Hobbit: An Unexpected Journey,” “The Hobbit: The Desolation of Smaug,” and “The Hobbit: The Battle of the Five Armies.” The “Lord of the Rings” series was also adapted into three movies, called “The Lord of the Rings: The Fellowship of the Ring,” “The Lord of the Rings: The Two Towers,” and “The Lord of the Rings: The Return of the King.” All of these stories, from Bilbo to Frodo, take place in the Third Age.